What a year 2018 was! I am so excited to tell you about everything we accomplished this year and what we are already excited to start in 2019. I hope that this report will capture some of our biggest successes and show you how proud you should be for being part of our accomplishments. If you’re reading this and not already involved in Friends of MADACC, I hope this will show you what an amazing organization it is and why I am proud to be a part of it. We have so many amazing volunteers and donors that make all of the work we do possible and will continue to work even harder in 2019. If you want to be part of that, you can sign-up to volunteer, donate, or email us for more opportunities! I’m going to let the rest of the impact report speak for itself. 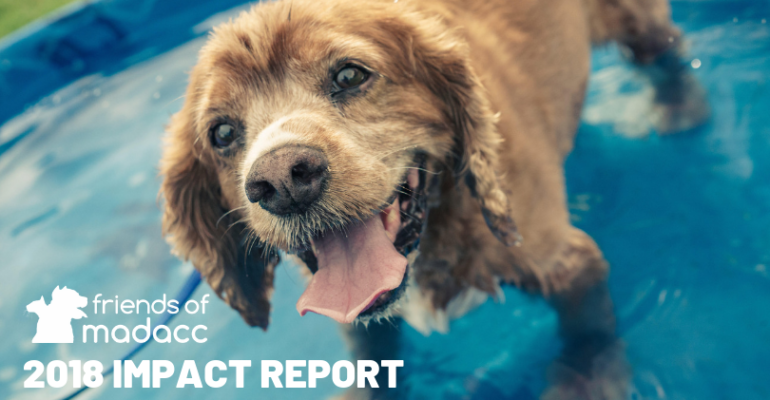 I hope that you enjoy reading it and hopefully learning a little more about the effect of Friends of MADACC on the Milwaukee County community and animals. I know we sure enjoyed looking back and putting it together! Read the full 2018 Impact Report. Apply to Be on the Friends of MADACC Board of Directors! 1. Reduce intake to MADACC. 2. Increase adoptions from MADACC. 3. Improve life at the shelter.